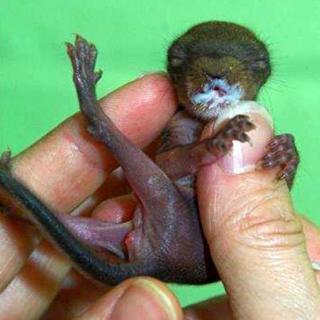 A one-week-old baby squirrel was rescued after a nest was discovered in a felled tree in Aberdeenshire. The Scottish SPCA is now caring for the tiny red squirrel - which has been named Billy - after the find in Insch earlier this month. Billy is being hand-reared at the charity's National Wildlife Rescue Centre in Fishcross. Centre manager Colin Seddon said: "Billy currently needs fed by syringe every few hours." He explained: "He should open his eyes at around five weeks old, and that's the same time the weaning process will begin. "Billy will remain in our care until he is completely independent. "Ideally, he'll be part of a group of red squirrels that can be returned to the wild together, at a supported release site. "Nesting season for both squirrels and birds is well under way so we urge people to take care when cutting down trees/trimming hedges. It's best to check for nests first to avoid any accidents."